Part 1 .. Photoscape Intro. Part 2 .. Selecting the image & identifying faults. Part 3 .. 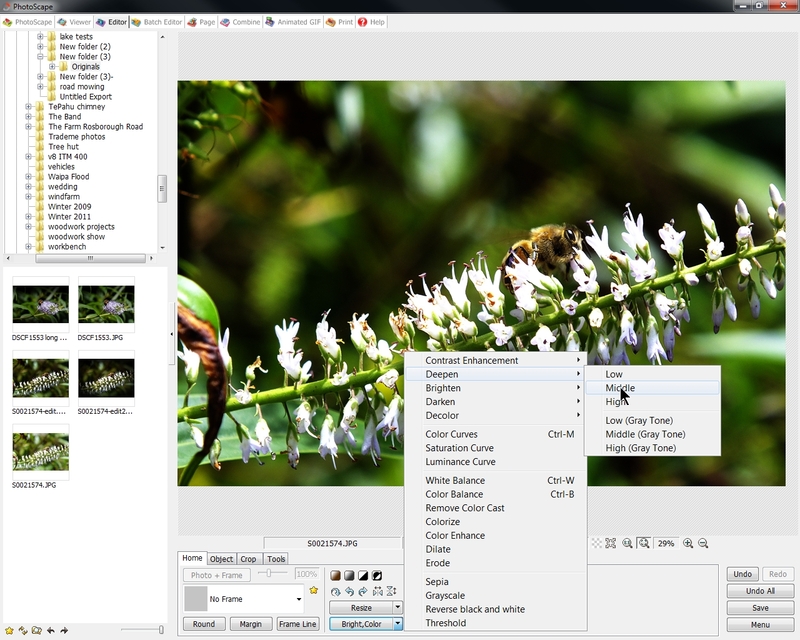 Using Photscape and its interface. 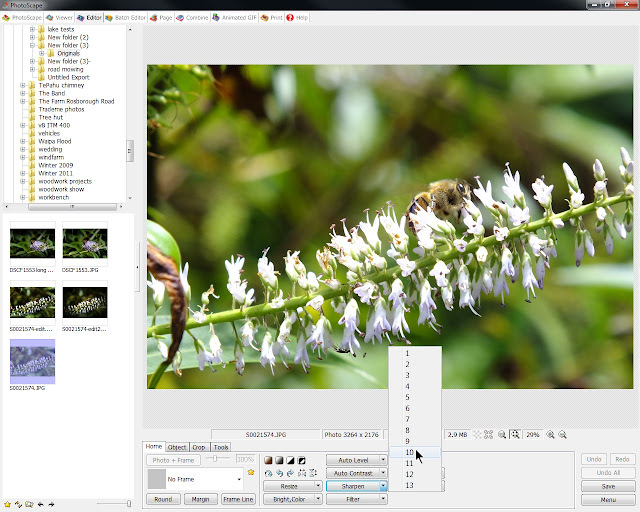 The first step is to load the image into the editor. 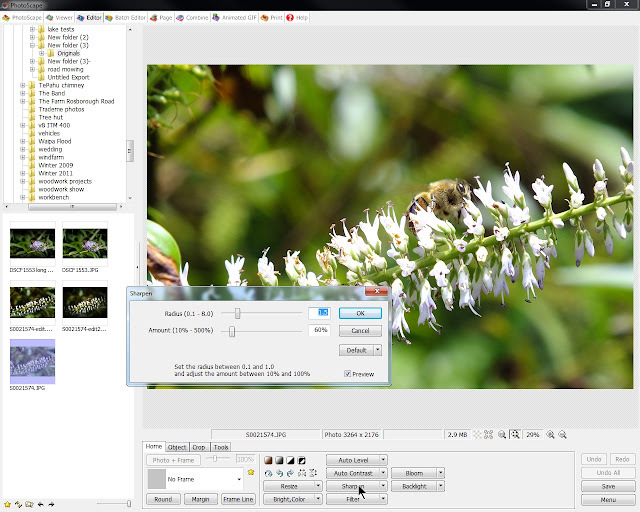 Once done I will normally click the auto level and auto contrast buttons. All I’m looking for here is to see if the editor can exhibit any obvious changes. It doesn’t always present you with the look you want, but the beauty of doing this is that it can give you a starting guide for exposure and tone. Click undo all when finished with this view as its only a preliminary guide. You will note that doing the above with both settings button shows a drop in the light and contrast intensity and tells us that there is plenty of room to move with this image. 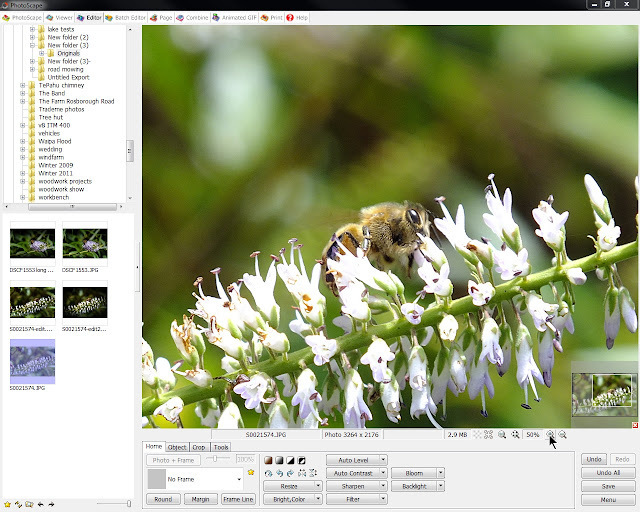 The aim of our editing here will be to show the subject (bee) in a microcosm environment. To the bee its the immediate area that surrounds it that becomes it own point of focus (and ours). We also want to try and give the image more three dimensionality (depth) or 3d perception. In essence we are going to reduce the impact of its surroundings to create a more refined and private setting for the bee. Sound like a whole lot of work? It may well do but the result might just surprise you. So here’s the image loaded in the editor and set to go. 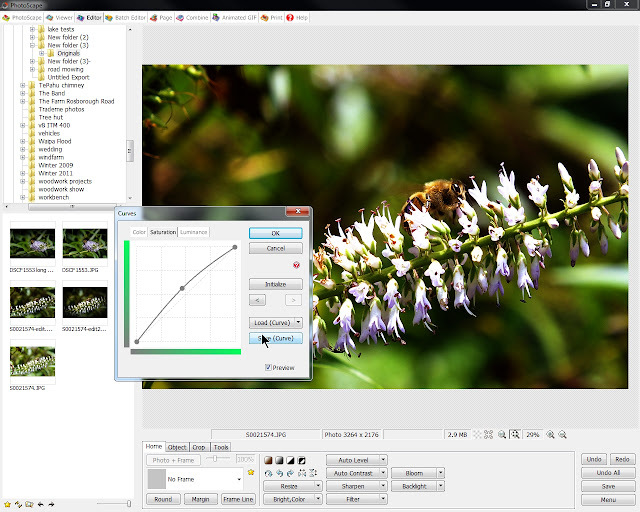 After doing our little auto levels test the next thing we need to know is how much we can sharpen the image. Theres no point doing anything else unless we know that the sharpness and apparent focus can be improved. In the image above you will note that I have selected the main sharpen button and the default settings have been applied. You can change these as you wish. Selecting the arrow toggle on the Default button will bring up a sub menu of sharpening settings as seen in the image below. You now see a setting of 9 highlighted above. Note how the radius and amount has changed. A setting of 1 is very fine in both radius and the amount of sharpening used. I seldom use more than 10 from this sub menu as I like to keep the sharpening as fine as possible. This sub menu for sharpening is always available, just click the toggle to access it, select the required amount and the processing will take place. No further user input is required. When applying changes I usually zoom the image up to 50% to see how well the change worked. One trick I use all the time is toggle the undo/ redo buttons. If I’m not sure how good a change was I will look at the image with the change applied, click undo to revert the image back to how it was prior to the change being applied. Don’t worry if you hit Undo All, just click click redoto re apply the change(s). 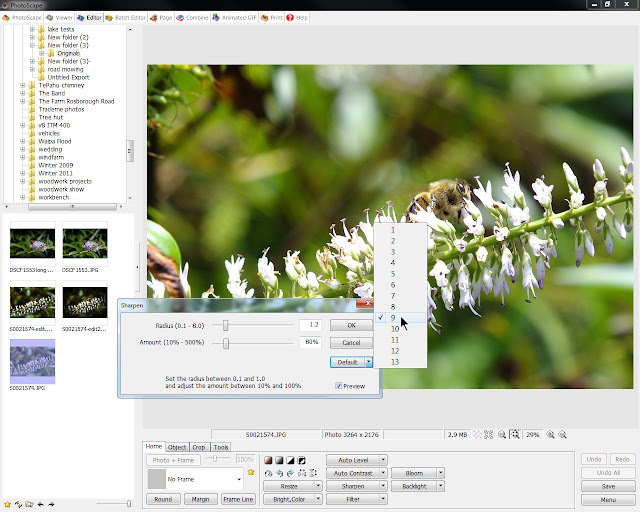 I find that this method while available to the user in other software packages just doesn’t seem to work as intuitively as it does in Photoscape. In Lightroom for instance the undo option is quite limited although available via shortcut keys. I personally like the speed of the mouse click option. Sharpening the image has brought out more of the detail in both the bee and flower. Clicking the button next to the percentage indicator will bring you back to the editor window. 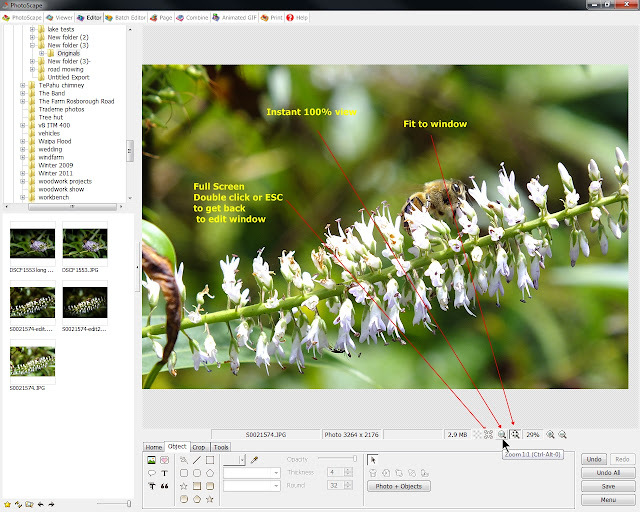 The option of instant 100% view is available via the button next to the edit window button. The third button available is the Full screen button and is a great way to check and see how the image looks full sized on the screen. You will note that when a view size other than the native resolution of the image is selected a small box appears in the right corner of the image showing a thumbnail. Use this to move to any part of the image simply by clicking and dragging the image either onscreen or in the thumbnail view. We now want to calm down the image somewhat as its still too bright and the background too busy. One of the most powerful tools in Photoscape is the Gamma setting. 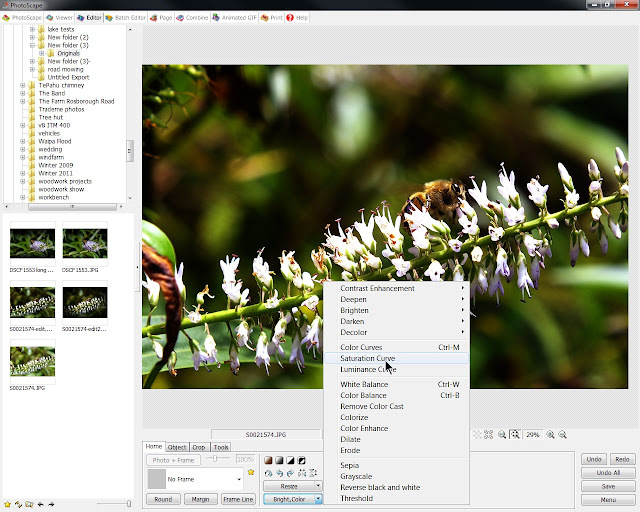 Select the main Bright,Color button and adjust the gamma slider. In this case I have reduced the gamma to 0.64 ( 1.00 is default). A good many of the post processing software packages don’t include the gamma setting, and most disappointinglyLightroom doesn’t have this provision. It does have a “Recovery ” slider but by comparison this is very limited. The image above shows my selection, and you can see the result is quite marked. Just click OK to finish. We are now beginning to see the direction of the image taking shape. Having adjusted the gamma we now need to consider how the background should look. I am going to deepenthe mid-tones of the background, however you may wish to use a lighter level in which case select deepen/low.You can see from the image above that using deepen Middle has calmed down the background. Selection for this process is from the sub menus of the Bright,Color button. We are going to takes this one step further using the same set of sub menus. This time I will select Deepen/Low (gray tone). The effect is quite subtle but helps again to reduce the background. When you compare the original to where we are now you can see that when have very effectively reduced the intensity and tone of the background. Doing this has begun to add that 3d look we are after. At the same time we have been able to leave the flower and the bee well lit without reducing the ambient light. This is an important factor as this is how you go about lifting the subject from the background. There are several other techniques for doing this depending upon what software you have available. You will further notice that at this point we still have a good amount of color tone in the background but it no longer overshadows the color of the bee. By the way have you spotted the small Mayfly that’s sharing the flower with the Bee? Most likely you will have noted that the overall image has a very green tone to it. As we have concentrated on the back ground, now we need to look at the overall color tone of the image, and it needs a little warmth added to it. 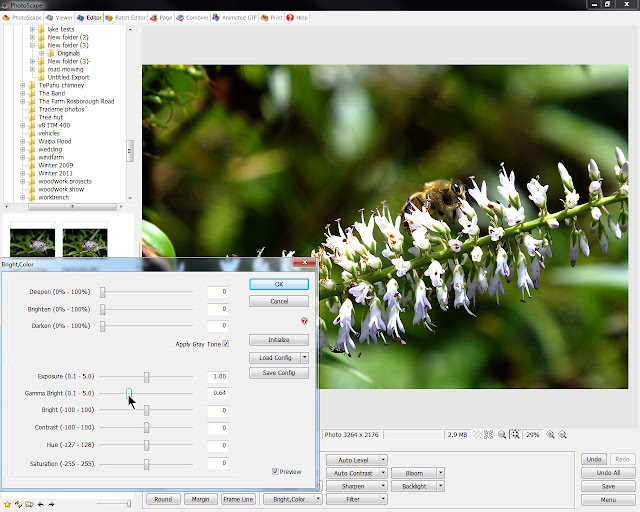 As you can see from the first of the two images above, we are going to use the Color Curves sub menu. Access this via the Bright,Color sub menu toggle as previously shown. To add warmth to this image we are going to adjust the Red channel only. To do this click the Red check box and deselect it as seen above. Click a point along the angled line and drag the point to the position you most prefer. In the image above I have selected a point approx. 60% of the way along the graph, knowing that this will introduce a reasonable amount of red to the image. The amount is controlled by how far you drag the selection spot from the center line of the graph. To deselect this or any point and start over, just right click the selection point and hey presto its gone. I’m happy with the selection at this point, there’s a little more red in the image and the violet of the flowers has been intensified a little as well, and you will note a good deal of the intense green has gone too. I should point out here that the wing of the Bee isn’t focused simply because it vibrating at a very quick pace. Oh and have you spotted the Mayfly yet? I’m a fan of color, and Fuji color in particular. As this image was shot using Velvia we want the color to be strong and a little more punchy. 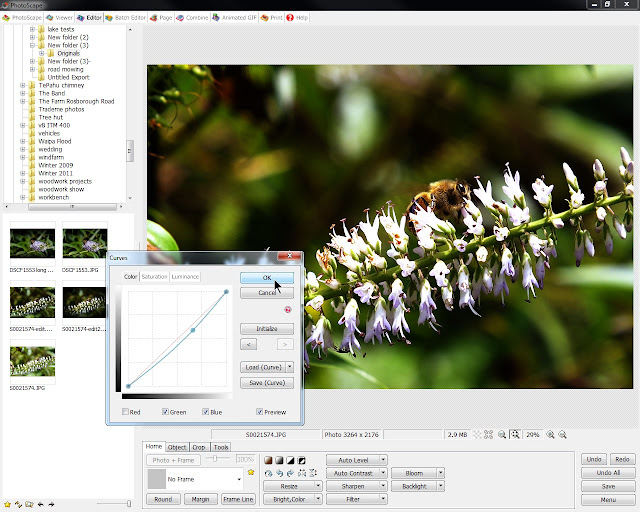 To do this we will adjust the saturation curve of the image. Select Saturation Curve from the Bright,Color sub menu. For this image I selected the curve at the mid point and slowly introduced more saturation to the overall image. You will note that the amount isn’t large. It’s best to use this method sparingly as it has a very powerful output. The image now has a good deal more vibrancy to the color and this is now evident in the flowers along the top of the stem exhibiting more of their natural violet color. If you compare the original to where we are now, its evident that the image has much more impact than it did originally. The feeling on looking into the bee’s world has become more prominent as well, as this was the effect we were hoping for right from the start. In the next section I will go through the steps for finalizing this image.